SEATTLE — NASA is considering buying two additional seats on Soyuz spacecraft to ensure a continued American presence on the International Space Station amid worries about additional delays in commercial crew flights. In a presolicitation notice filed Feb. 13, NASA announced it was considering contracting with the Russian state space corporation Roscosmos for two Soyuz seats, one on a mission launching in the fall of 2019 and the other in the spring of 2020. The notice was first reported by NASASpaceFlight.com. 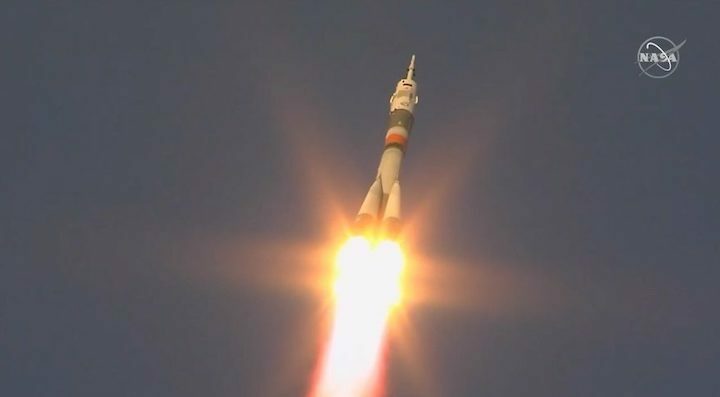 The additional seats would ensure that NASA astronauts can remain on the station after the end of this year, when NASA’s current access to Soyuz seats runs out. “This Soyuz seat procurement ensures uninterrupted access to the ISS in the event of a delay in U.S. commercial crew launches, mitigating the significant risk to ISS safety and operations that the absence of U.S. crew members at any point in time would cause,” the procurement notice states. NASA originally planned to have commercial crew vehicles under development by Boeing and SpaceX certified by the end of 2017. Both companies, though, have experienced significant delays, and neither company has flown their vehicles yet on uncrewed test flights, let alone those with astronauts on board. SpaceX is scheduled to launch its Crew Dragon spacecraft on a test flight without astronauts on board no earlier than March 2. The two seats would ensure NASA astronauts would remain on the station through September 2020, by which point the agency expects at least one of the two commercial crew vehicles to be certified and starting to fly astronauts. Even if both vehicles are certified before then, NASA argues that the overlap period between Soyuz and commercial crew will be beneficial. NASA regularly bought Soyuz seats, albeit at steadily increasing prices, from Roscosmos in the post-shuttle era as it developed commercial crew vehicles. The last contract, signed in 2015, covered Soyuz seats on missions to the ISS through 2018. At that time, NASA was still expecting commercial crew vehicles to enter service by the end of 2017. In 2017, NASA agreed to buy five Soyuz seats from Boeing, who had obtained them as part of an agreement with RSC Energia to settle a legal dispute regarding Sea Launch. Two of the seats were used to augment the size of the NASA crew on the station in 2017 and 2018, while three were reserved for transporting crews to the ISS in 2019 as a hedge against commercial crew delays. It’s not clear how the two Soyuz seats became available. In late 2016, shortly before buying the seats from Boeing, NASA officials said it was too late to contract directly with Roscosmos for seats because of the multi-year lead time required. NASA spokespersons did not respond to request for comments Feb. 15 about these seats or the estimated price NASA would pay Roscosmos for them. The latest annual report of the Aerospace Safety Advisory Panel (ASAP), an independent board that advises NASA on safety issues, recommended that NASA develop a contingency plan for accessing the station should commercial crew flights suffer more delays. “Due to the potential for delays in the schedule for the first [commercial crew program] flights with crew, senior NASA leadership should work with the Administration and the Congress to guarantee continuing access to ISS for U.S. crew members until such time that U.S. capability to deliver crew to ISS is established,” the report, released Feb. 8, stated. NASA had not provided a formal response to that recommendation at the time the report was printed.